RootsTech..... for me and YOU. So in a sense, we can learn something together!!! I shall miss the February meeting; see you in March. Your Digital Digest committee works for YOU. This is the editorial committee for the EWGS Digital Digest: Gerry Gosche, Juanita McBride, Pat Bayonne-Johnson, Jeanne Coe, Diane Boyd (also our webmaster), Bill Hire (assistant webmaster), Bette Topp and Donna Phillips. We met on Tuesday, 17 January, to plan the next several issues of the Digest, working diligently to ensure that the content is of worth and interest to our members and to those living elsewhere coming to our website for their research needs. We work for YOU. All we ask is that you click to the www.EWGSI.orgwww.EWGSI.org website and take the time with our new digital publication as you did with our paper publication. And most certainly, we would welcome input and participation from YOU. March 10.......... Is Your Calendar Marked???? Seminar: 9:00 a.m. - 4:00 p.m. This is one of my favorite pictures. 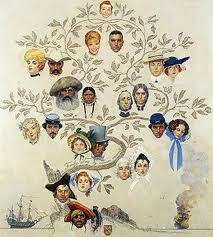 It is a painting by Norman Rockwell and appeared as a Saturday Evening Post magazine cover in the 1950s. Since this piqued my interest way back then, and I'm still interested in family history today, I count myself lucky! But on to New Year's Resolutions......... why make them only to ignore or break them by the end of January? How about just look at and analyze your days and see where and upon what are you spending the majority of your time? Will that something matter in 100 years? The thrift shops are (unfortunately) full of quilts and crocheted items and painted china. A thoroughly cleaned house will be messy again within a week. Your family, your ancestors, were, are and will be of interest continuing forever so why not concentrate on your family and your family history?? EWGS stands ready and willing to assist you; wouldn't you like to know if there was a one-eyed pirate in your family tree? 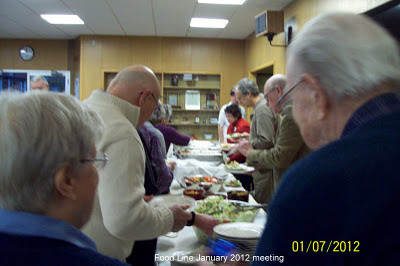 The January 7, 2012 luncheon started with the buffet line, good food. 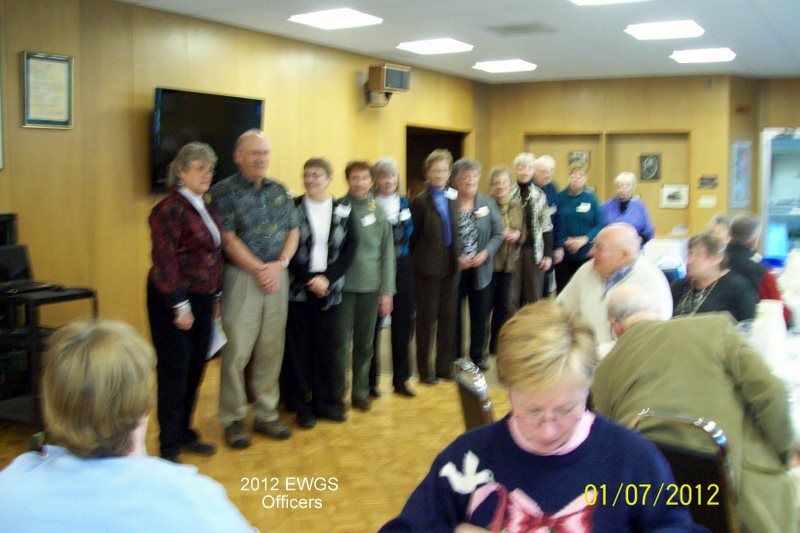 After lunch the EWGS officers for the 2012 year were lined up so everyone can see them. Announcements for the February, March and April meetings. 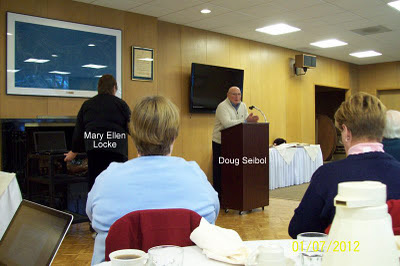 The past presidents and distinguished service members were asked to stand, and then the speakers Doug Seibol and Mary Ellen Locke showed pictures of their trip to western Siberia to meet Doug's Seibol relatives that were still living in that area today. They had actually tracked him down as a Seibol uncle had migrated to Odessa, Washington in the early 1900s. Very interesting pictures. 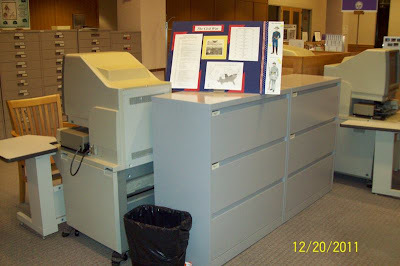 New look in the genealogy section of the library, three of the broken microfilm readers have been removed, then they swung the vertical file around where a couple of microfilm readers were before.